Two of the features which most impressed me of the Particle Photon were its built-in WiFi, and the possibility of updating the device over the air (OTA). However, using a Photon as, say, a simple temperature sensor is quite expensive at over EUR 23.00 when purchased here. 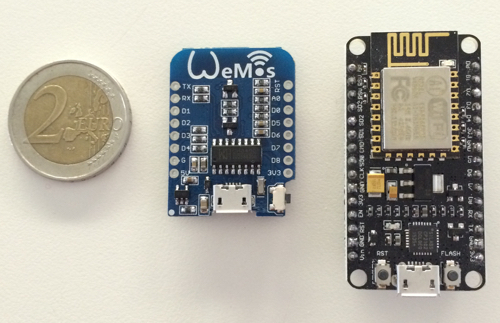 Both of these are based on the ESP8266, and as such they have on-board WiFi. The NodeMCU can be flashed with firmware which supports the Lua programming language (or even BASIC I hear). I’ve settled on using an environment I’m more or less comfortable with, namely the Arduino for ESP8266 firmware which is trivial to install through the Arduino IDE. These little microcontrollers just work, but what is a bit of a chore is having to invent boilerplate code which enables reconnection, reboot on error, etc. I stumbled over a project called homie-esp8266 created by Marvin Roger. 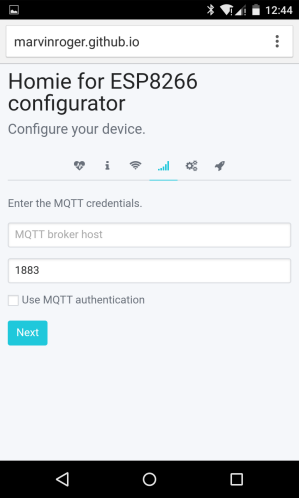 It’s basically a small framework which couples the ESP8266 to MQTT and provides automatic connection/reconnection handling, JSON configuration, an optional Web UI to configure the microcontroller which starts up in Access Point mode initially, and Over-The-Air support for updating the code I create for the ESP8266. Yes: OTA support, and TLS. $nodes inform the consumer about the type of endpoints I’ve made available on the device. $online indicates whether the device is currently alive, $name is a description I initially assign to the device, $signal is an indication of WiFi coverage as seen by the microcontroller, etc. Then the device starts publishing a temperature and whatever other sensor data I wish to make available from the device. Once that is done, the device connects to the WiFi network you specify during configuration, and starts operating on that. Alternatively, we can upload a JSON configuration file to the flash file system on the device or create that programatically (which is what I did, using a small sketch). The great advantage of storing the configuration separately from the actual Homie firmware is I can reflash (for example OTA) a different sketch onto the device and it will use the previous configuration settings (e.g. for MQTT broker, port, etc.). OTA updates are triggered by publishing a version number to the $ota endpoint; Homie then verifies the version it’s received is higher than the one it’s running, and instructs the ESP to boot and get the update via HTTP/HTTPS. (How this works is rather well explained here.) I think it’s important to mention that the homie-esp8266 framework is cloudless; it doesn’t require a cloud service, and it talks exactly to the servers you configure it to speak to. Homie’s documentation is good and plentiful, and there are examples to get us started quickly. Marvin has been tremendously helpful, and he very quickly implemented the possibility to define a base_topic for MQTT publishes when I asked him to. A stamp-sized chip with on-board WiFi and 4MB of flash which speaks MQTT over TLS and can be updated OTA for under EUR 4.00. Exciting times. Ben found another firmware for ESPs called ESPEasy. I gave it a glance, and it looks quite capable, but it appears to be geared to people who want a bit more of a toolbox on their ESP.